The 16th Annual Honolulu Festival finally began on Friday, March 12. 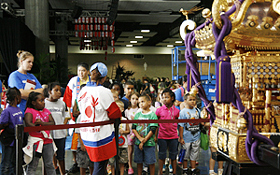 The first event was the Educational School Tour, which was held for the local schools at the Hawaii Convention Center. Those students that participated in this event observed the preparation of various performers and exchanged with some of the performing groups from the countries of the Asia-Pacific region. They also learned that there are various cultures in the world and experienced them. The students were listening attentively in front of the decorated mikoshi displayed inside the venue as the performers explained about the history of the Japanese festival and the Japanese spirits toward the mikoshi. 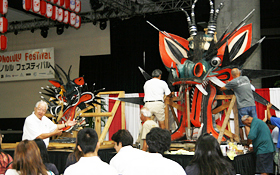 In addition, they learned about the background of the Honolulu Daijayama and observed how its head is being assembled. Also, Descendance from Australia performed the Australian Aboriginal dance and music to represent the culture of the Asia-Pacific region. They told their Australian Aboriginal culture through dancing which is deeply connected to the nature and life. Furthermore, the Alaska Native Heritage Center Dancers from Alaska introduced the traditional clothing, instrument and dance of the Alaskan Natives. The children saw the Alaskan traditional fur shoes and drums for the first time, which they were smiling as they touched them. 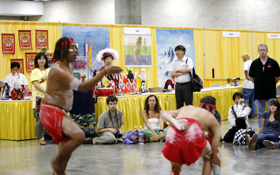 The students were intrigued by the unique and beautiful movements of the Alaskan dance, which they felt a different impression than the hula dance that the people on Hawaii are familiar of. There were 4 taiko drumming groups from Japan called Kaze-Damari, Taikojuku Miyako, Taiko Kozo and Wadaiko Mamezakura. 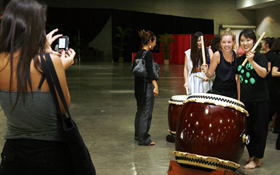 Even though every group uses the same type of drum, each of them has their own shape and sound of the taiko drums, which there were various sizes of big and small. Also, the sound resonated throughout the venue, which felt as though the whole place was trembling by the vibrations from the taiko drums. 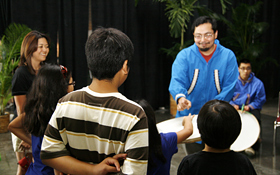 The members of Taikojuku Miyako are teaching the students. The members of Taiko Kozo and Wadaiko- Mamezakura. The members of Kaze-Damari are teaching students. The member of Kaze-Damari with the student. 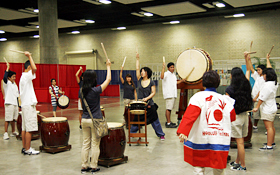 There were various taiko drumming groups this year and each of them was popular. There was a scene, where one of the students from the language school screamed “I want to be here forever!” when their teacher said “It’s over! We are going to the next one” after the drum lesson by Kaze-Damari. At last, he was been pulled by his friends and forced to exit the scene. One of the commonality in all of the taiko drumming groups is that everybody was facing each other with smiles as they were drumming in unison. 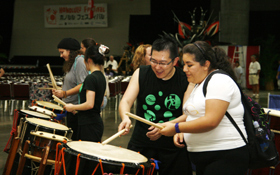 It can be said that the taiko drum created a power of communication, which was more than the words can describe.